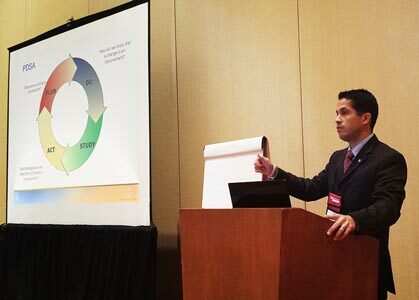 Eddie speaks about applications of Lean and Six Sigma in Healthcare at conferences and he is available for speaking engagements, training or facilitating workshops to help your organization achieve higher quality, higher employee engagement and higher customer/patient satisfaction. To book Eddie Pérez-Ruberté for a speaking engagement at your organization or event, please, use our Contact Form and select “Speaking” in the Subject drop-down menu. If you want your audience to be engaged and motivated to act and think differently, and you want to build a culture of problem solvers, Eddie will uncover the insights and strategies they need to accelerate business and personal growth and leave your organization positioned to achieve World-class status with his highly-interactive style. Eddie will stop at nothing to deliver a truly motivational fact-based experience full of actionable takeaways.